A relatively inexpensive business notebook with a good performance, long battery life and even environmentally-friendly: Who could resist that? We've checked if Lenovo can keep its promotion promises. 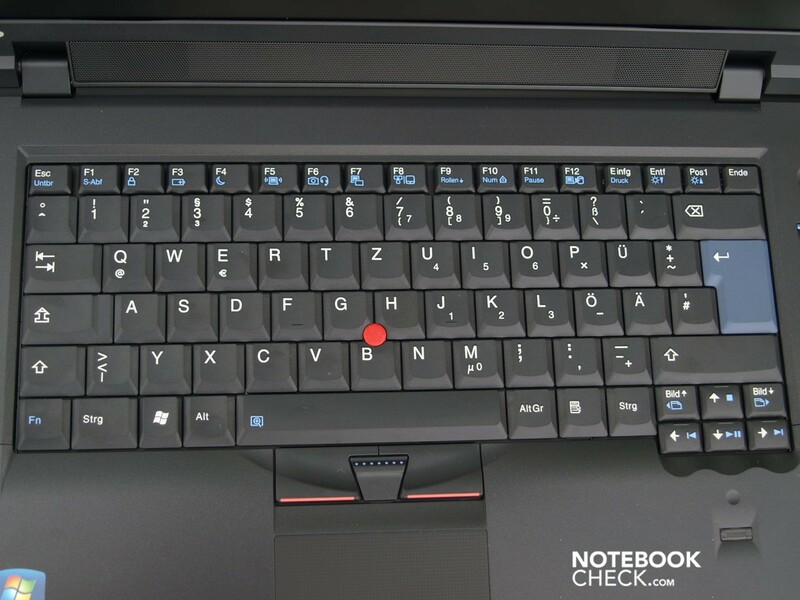 Up until now, there isn't any detailed information about the new Thinkpad L family on Lenovo's German-language websites. Therefore, we have to refer to information of the American site and to the technical specifications of our test model. 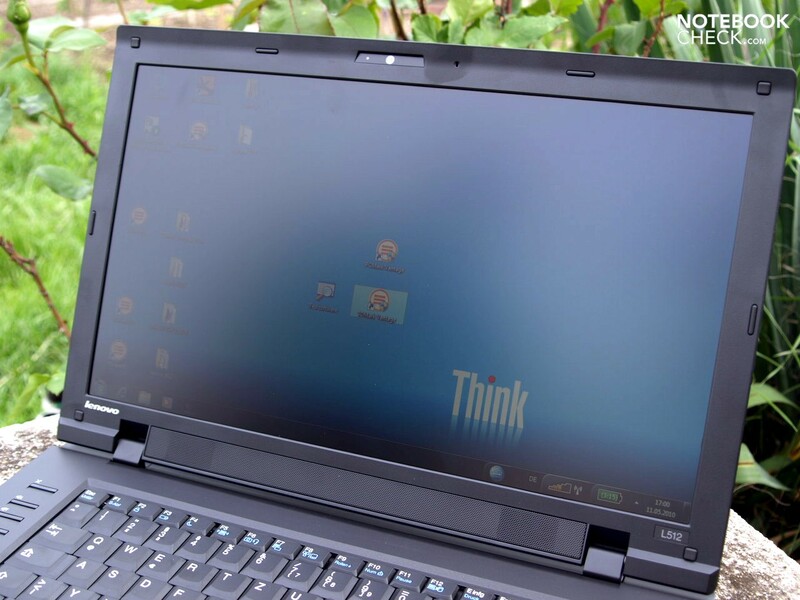 According to Lenovo, the Thinkpad L Series is allegedly the "Greenest Enterprise Thinkpad Laptops". Two sizes are available: A 14 incher called Thinkpad L412 and a 15.6 inch model named Thinkpad L512. 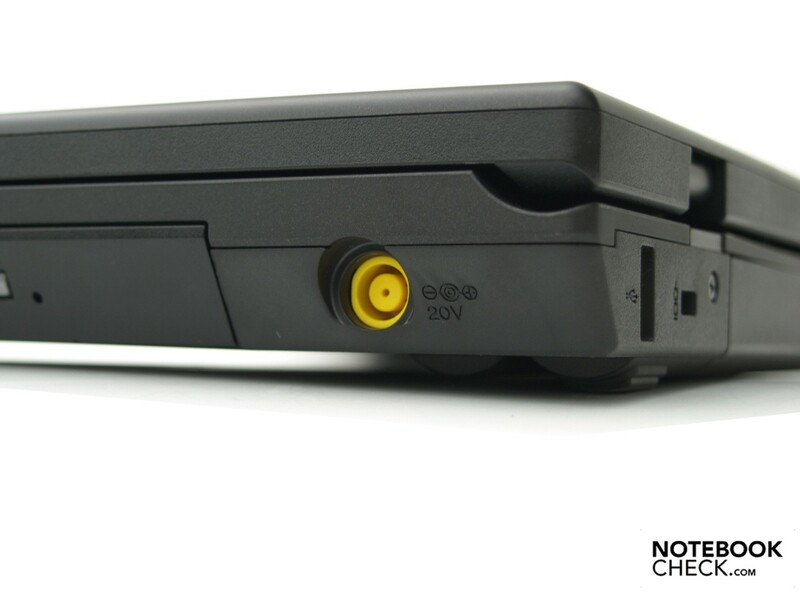 In the following, we will deal specifically with a certain 15 inch model, which is the Thinkpad L512 -2597-5VG. It's equipped with a Core i3 M330 CPU, which has an integrated GMA HD graphic solution, a two gigabyte RAM and a 250 GB hard disk. 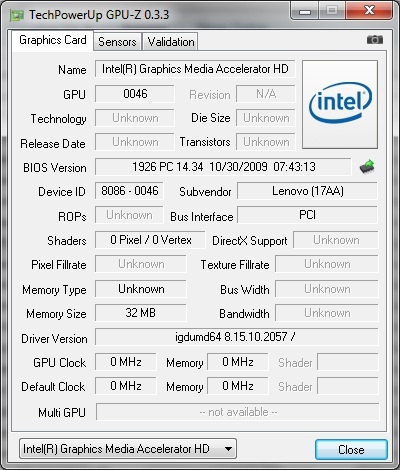 However, there are several configuration possibilities with various processors up to a Core i5 540M, up to 8 gigabyte RAM and other hard disks in the USA, whilst all are equipped with a GMA HD graphic solution (unlike the L412 models that are allegedly also available with a dedicated ATI Mobility Radeon HD 5145 according to specifications on the US site). As usual, sections that are dependent of key components do not necessarily apply to differently equipped models. 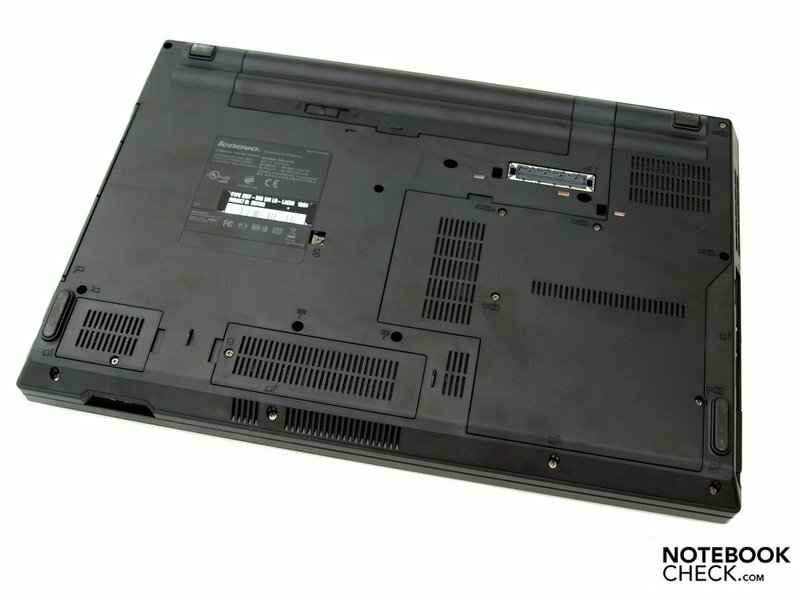 A typical Thinkpad in the well-known, elegant, black plastic case, you'd think. Actually, you won't find any overwhelming innovations on the outsides. Merely the design inside - power button, hot keys and status LEDs - has changed a bit. 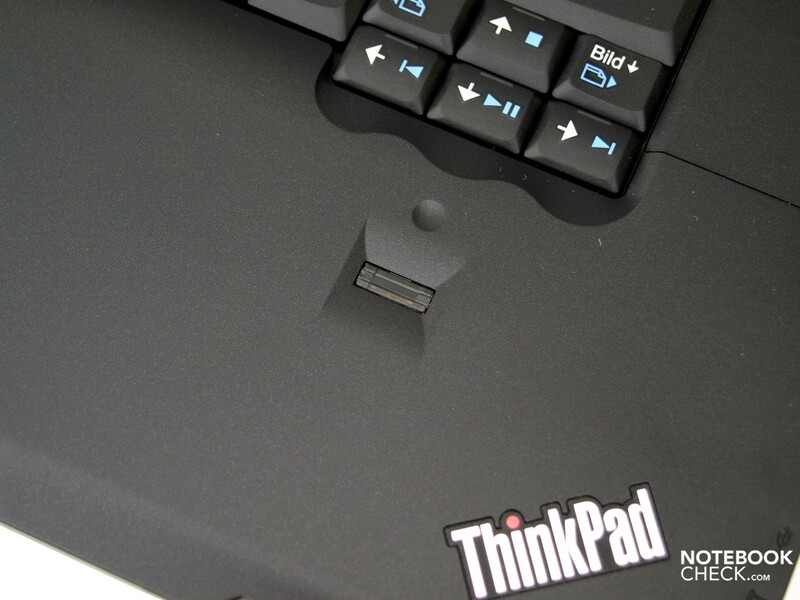 The ThinkPad's trademark, the ThinkVantage button, on the keyboard's right in the prototype, and Lenovo's comfortable ThinkVantage tool assigned to it, is of course part of the package. The plastic case yields quite obviously around the keyboard and on the wrist-rest under pressure. In return, the display lid is more pressure resistant and only twists slightly when picked up at a corner. According to the manufacturer, the small black hinges are made of a zinc alloy, and are supposed to increase the durability. They are fairly stiff, but can't prevent an obvious teetering after adjusting the opening angle, anyway. That is limited to about 150 degrees. A transportation lock has been left out. The notebook is kept securely closed despite that. 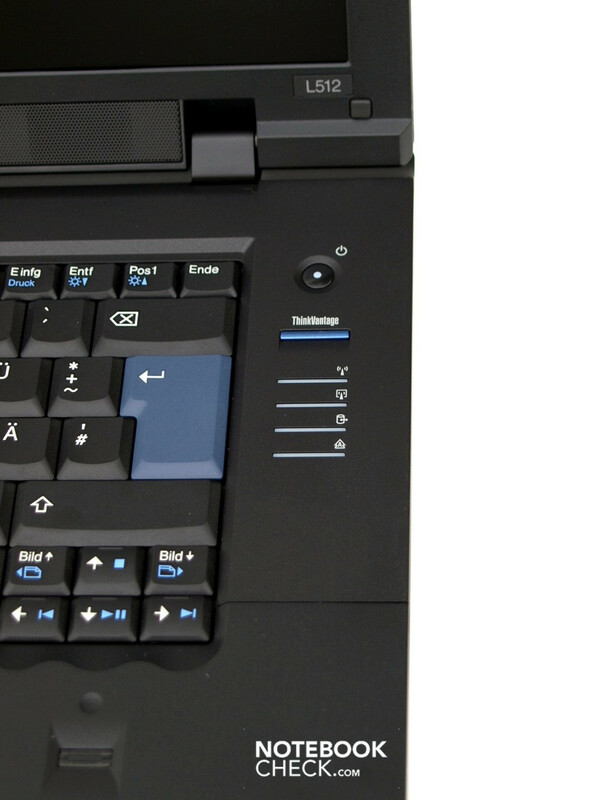 A slight clamshell design also abates the danger of foreign objects penetrating between keyboard and display. The measures for reducing an environmental impact are of course not verifiable in detail. 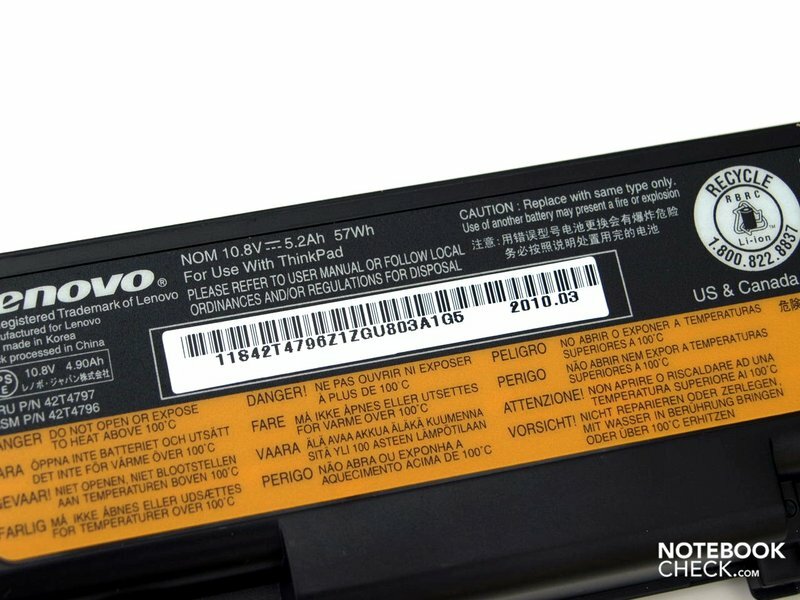 Lenovo, however, states that the product has been rated with EPEAT Gold and with ENERGY STAR 5.0, so as an energy savings office device. Aside from that, Lenovo also is a participant of the Climate Savers Computing Initiative. Additionally, up to 30% of the used materials allegedly originate from recycled end products. 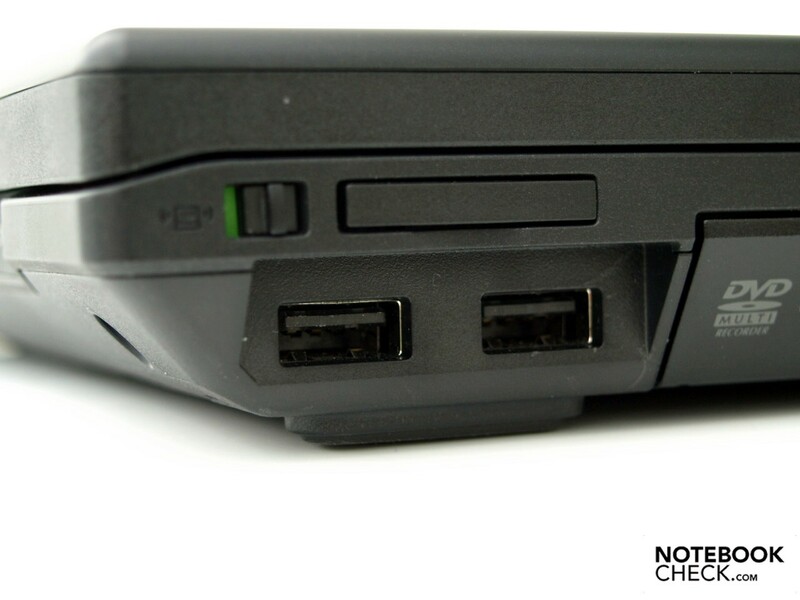 The for a business device mandatory docking port is, as known of other ThinkPads, on the base unit's bottom. 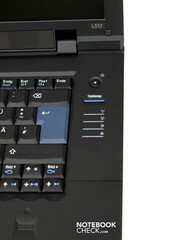 According to "Option Compatibility Matrix: Thinkpad L, R, T, W Series (May 1st, 2010)", which can be downloaded from Lenovo's homepage, the Thinkpad L512 is compatible with the following docking stations: ThinkPad Port Replicator Series 3, ThinkPad Mini Dock Series 3 (90W Adapter - U.S. Power Cord), ThinkPad Mini Dock Plus Series 3 (90W Adapter - U.S. Power Cord). Viz. in all likelihood, only the Port Replicator Series 3 will be available in Europe. It extends the interface options by 4 USB 2.0 ports and has only one VGA and RJ-45 port. 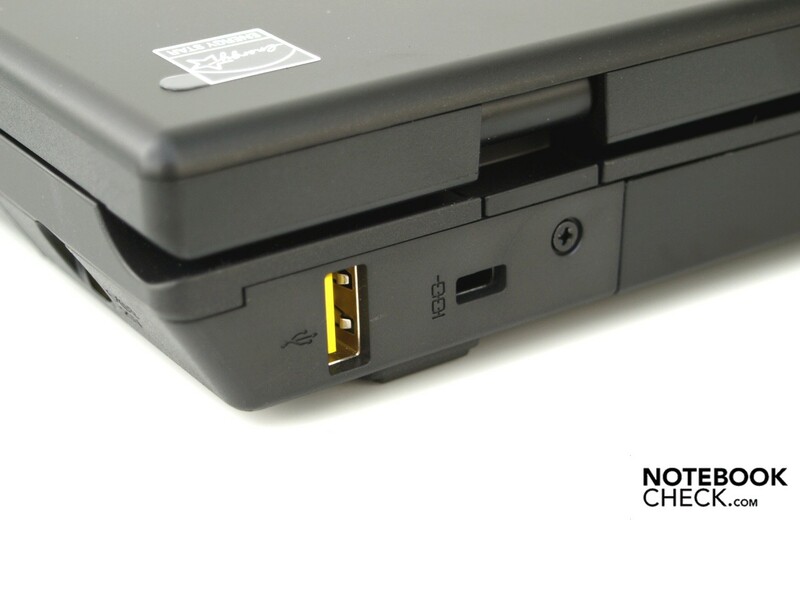 Connecting an external monitor to the digital display port or an external drive to the USB/eSATA combo socket will still lead to a restriction of the work space on the notebook's left when the docking station is used. 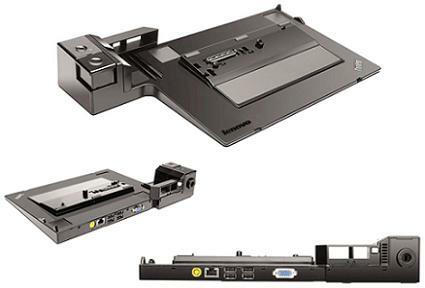 The Thinkpad Mini Dock Plus Series 3 would provide for a comprehensive docking solution, but the eSATA and audio interfaces remain disabled for the ThinkPad L412, L512 and those on the case have to be used. The port configuration directly on the case is satisfying. A projector or external monitor can be connected either analog via VGA or digital via display port on the left. Besides the 3 USB 2.0 ports, one of which is a powered USB port, on the rear there is also the possibility of connecting external mass memory devices via the combined eSATA/USB port. Thus, even faster transfer rates than over USB are possible, if it's supported by the device. 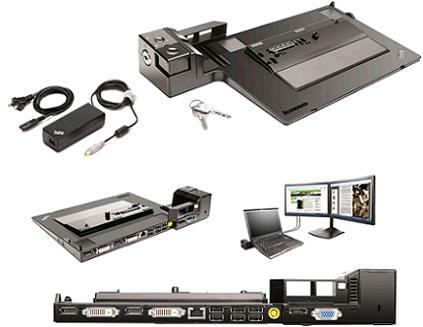 The functionality can be extended with the ExpressCard/34mm. The built-in cardreader is a 7-in-1 cardreader, which supports following formats: SD, MS, MS Pro, MMC, xD, SDHC, xD Type H. There is only one audio socket that has been made as a combo audio socket. The interface distribution isn't perfect for lefties, though. Righties have a slight advantage. Aside from two USB 2.0 ports on the right's very front, no cables can get obtrusive. A cable tethered Realtek RTL8168D/8111D Family PCI-E GBE NIC (10/100/1000MBit) takes care of fast transfer rates in an according infrastructure. A Realtek RTL8191SE Wireless LAN 802.11n PCI-E module, which also supports standard-n, has been built into our test device for communication with Wi-Fi hotspots. At least there are a few options regarding WLAN cards in the US: A ThinkPad bgn Wireless is built in standardly, an Intel Centrino Advanced-N 6200 (2x2 AGN) is available for a surcharge of $20.00, an Intel Centrino Advanced-N + WiMAX 6250 costs $55.00 more. Moreover, you can upgrade the ThinkPad L512 with an integrated broadband modem for 150 US dollars and with Bluetooth for about 20 US dollars in the USA. Video conferences shouldn't be a problem with the 2.0 MP webcam (1600x1200 pixels) either, which is also supposed to be sufficiently sensitive in low light conditions. It has been placed, as so often, in the upper display bezel. As usual, Lenovo is also quite stingy in terms of included supplies for the Thinkpad L512. There are only a few papers aside from the power adapter and power cable in the box. There isn't an interface description or a manual, not even in electronic form directly on the laptop, not to mention other useful items, such as recovery media or driver and utility software DVDs. But these can be created with the comfortable ThinkVantage tools easily. Aside from that, a trial version of Microsoft Office 2007 and InterVideo WinDVD is pre-installed. 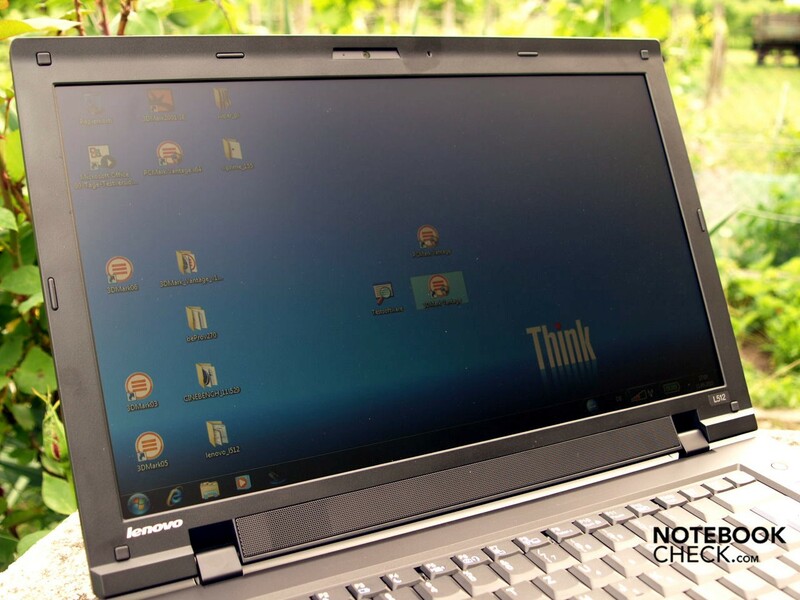 The ThinkPad L512 makes it easy for those who like to maintain or upgrade their notebook themselves. The system components are easily accessible via maintenance covers. The test device only had 2GB of RAM, inserted as a single bar. So what's easier than adding one more? You should, however, choose a 64 bit operating system with 3 GB or more, in order to be able to use these efficiently. 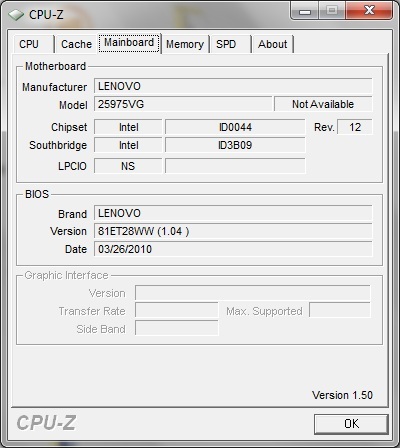 Windows 7 Professional 64 bit had been pre-installed on our prototype. 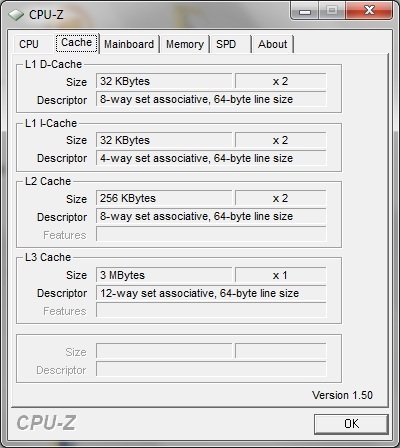 Possible options range from Windows 7 Home Premium 64 bit up to Genuine Windows 7 Ultimate 64 bit. The keyboard is as usual. In the beginning you have to get used to the exchanged FN and left Crtl key. But afterwards, you can deal with the keyboard layout during touch-typing quite well. The typing noise is fairly quiet with exception of the space key. The subconstruction also copes well with normal typing and doesn't coil in normal use. 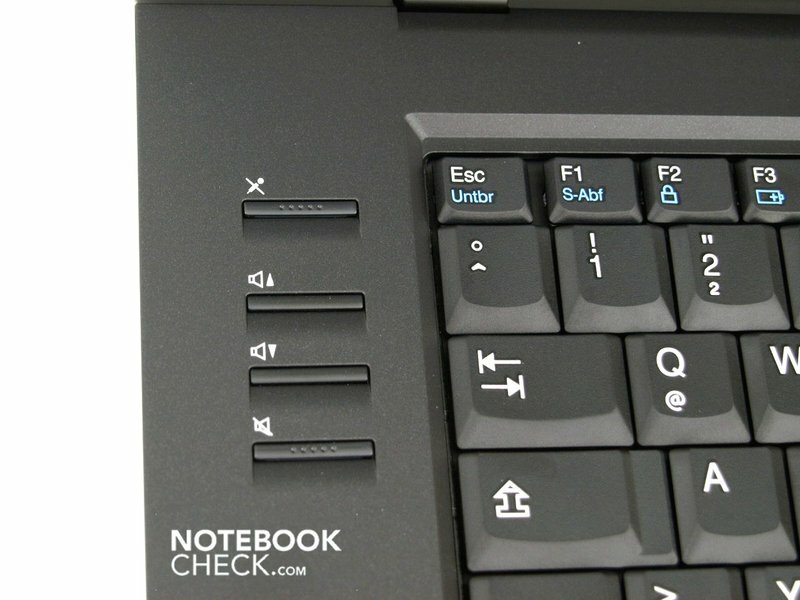 In regards to the typing feel, you can describe the employed keyboard as quite “ThinkPad-typical”. Thus, every single key has a good pressure point with a very generous stroke length for notebook conditions. There's nothing to complain about in terms of key size, either. 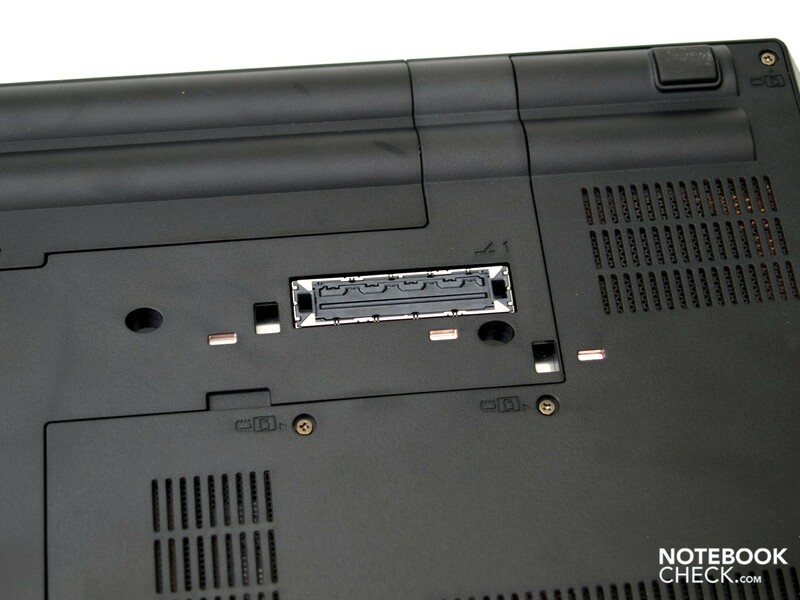 The keyboard is splash water protected for protecting the laptop. 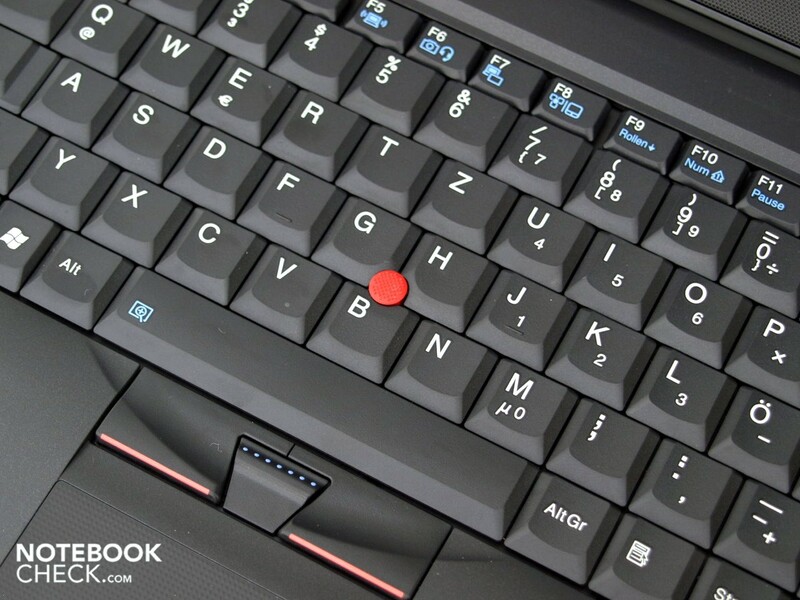 The trackpoint is once again in the center of the keyboard as a red rubber stopper, and has been designed very ergonomic and user-friendly. This applies equally to the trackpoint's form, its response, as well as its three correlating buttons. The touchpad proves to have a pleasant to use surface with an optical and haptical marked horizontal and vertical scroll field. 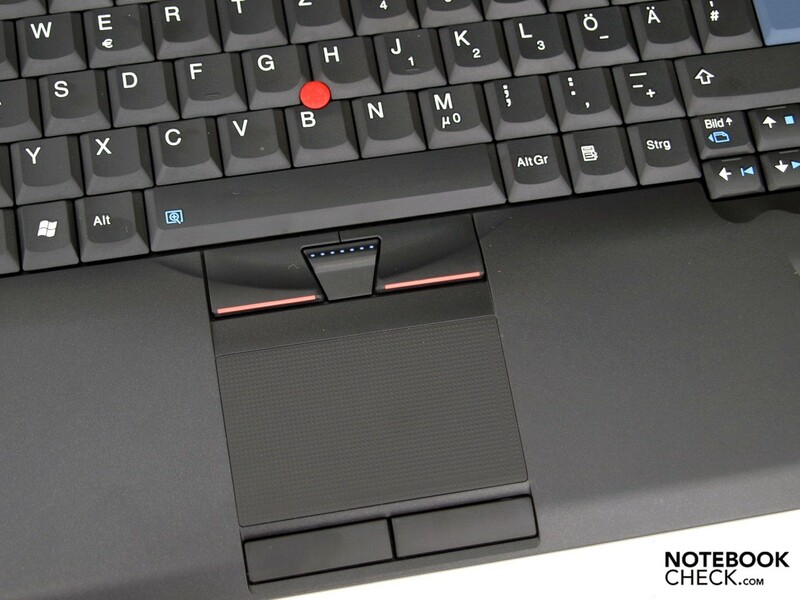 Both touchpad keys can be used very well due to their position on the front edge, both while navigating single-handedly with the thumb, as well as with two-handed use. A few multi-touch gestures are also supported, which have to first be enabled in the mouse settings to a part. 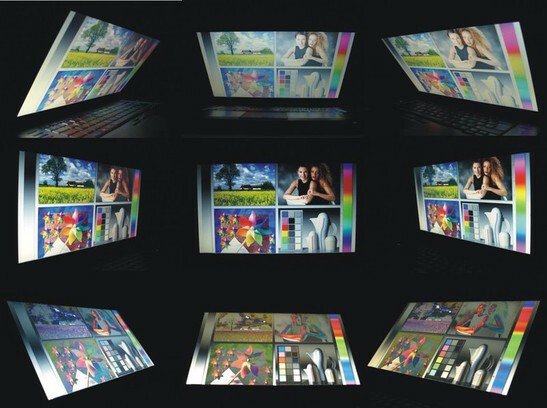 A display from Chi Mei Optoelectronics (CMO) was used in the test device. More precisely, it was a 15.6 inch display called N156B6-L0A (-> manufacturer specifications). It has a resolution of 1366x769 pixels and thus a 16:9 format. A widescreen format is often less suitable for vertically aligned office applications because you have to scroll sooner. Even more so because 1366 pixels of width are too little to, for example, display two applications completely beside each other. Lenovo satisfies the business claim with the matt surface. A reflective display doesn't come in question for professional permanent use, anyway. You can at least be content with a maximum brightness of 219 cd/m2, which has been measured in the display's lower section. Unfortunately, the brightness plunges to 155.1 cd/m2 in the upper right section. Thus, the display only achieves a moderate illumination of 71% and an average brightness below the 200 cd/m2 mark. A contrast of merely 173:1 can be achieved because of the fairly high black value of 1.22 cd/m2. Subjectively, the color representation is sufficient for the ThinkPad L512's designated application field, which is office and internet applications. You won't have to worry about the light incidence indoors or struggle with annoying reflections outdoors due to the matt surface. Regrettably, the brightness isn't high enough for reading the displayed content easily when used in direct sunlight, though. The viewing angles are notebook-typical. The desktop is, as usual, generous on the horizontal plane, and in return very tight on the vertical plane, where color changes also turn up early, beside the usual over irradiation when looking down and dimming when looking up. Thus, a joint discussion about business statistics in front of the L512's display is only effortless with business partners of about the same size. 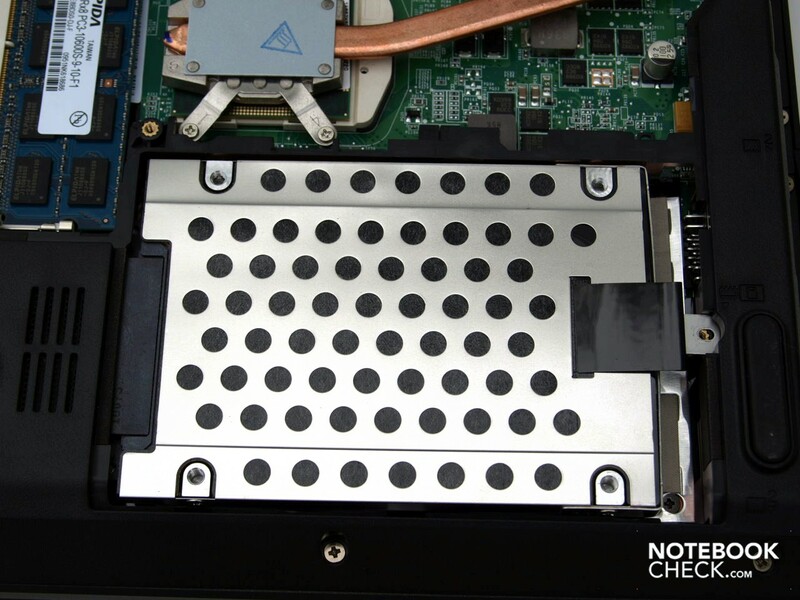 The ThinkPad L512 uses Intel's Arrandale architecture and is based on the HM55 Express chip set. There are a few alternatives in the US shop, starting with the basic configuration with an Intel Core i3-330M processor (2.13GHz, 3MB L3, 1066MHz FSB) over a Core i3-350M processor (2.26GHz, 3MB L3, 1066MHz FSB) for an additional 55 US dollars and a Core i5-520M processor (2.40GHz, 3MB L3, 1066MHz FSB) for a surcharge of 120 US dollar up to a Core i5-540M (2.53GHz, 3MB L3, 1066MHz FSB) for an additional $200.00 to choose from. 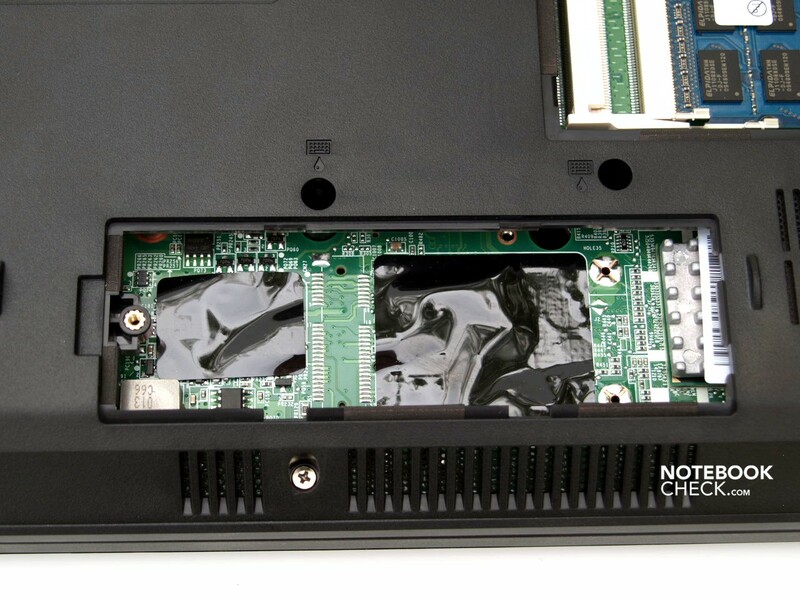 Those who await a dedicated graphic card will be disappointed from the ThinkPad L512. It uses an Intel Graphics Media Accelerator HD grafic chip integrated into the processor in all configuration alternatives. In return, you are spoilt for choice when it comes to the RAM configuration. 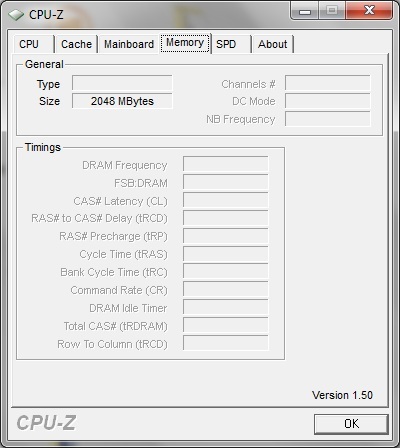 A minimum of 2 GB DDR3 SDRAM 133MHZ in the standard configuration up to 8 gigabytes, for which an additional 650 US dollars are due. Our prototype correlates to the basic model in all mentioned issues, viz. it has a Core i3-330M CPU, an Intel Intel Graphics Media Accelerator HD and only a 2 gigabyte DDR3 RAM. 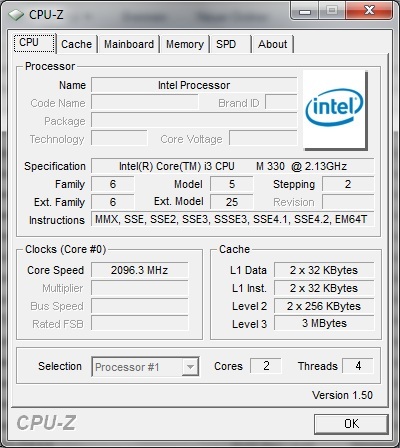 A drawback of this CPU choice is that the Core i3 family doesn't support turbo boost. You shouldn't let Lenovo's promotion video mislead you. 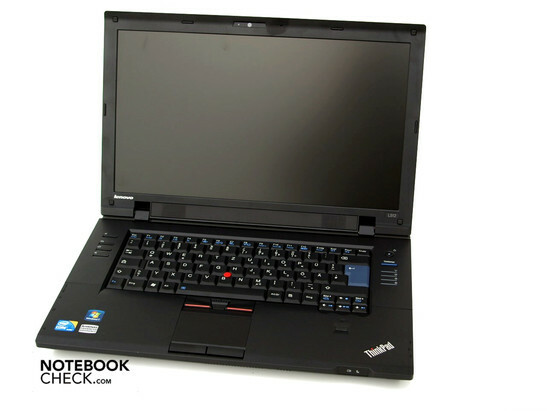 The ThinkPad L512 achieves a total score of 4684 points in PCMark Vantage. In this, the interplay of the components for the application performance is evaluated, whereby the graphic performance only has an inferior impact. Therewith, the L512 is practically on the same level as Lenovo's old workstation, the Thinkpad W700, in terms of application performance. HP's ProBook 6540b with a Core i5 430 and an ATI Mobility Radeon HD 4550 and a 2 GB RAM, which we have reviewed, achieved 5158 and thus about 10% more. The Dell Vostro 3500, also with a Core i5 430M, GeForce 310M and a 2GB RAM reached 5340 points, so circa 14% more. You'll find devices with Core 2 Duo hardware in our benchmark list that lag a bit behind, for example Dell's Latitude E6500 (Core 2 Duo P9500, Quadro NVS 160M, 4 GB RAM) with 4016 points or -14% and Acer's Extensa 7630G (Core 2 Duo T6570, ATI Mobility Radeon HD 3650) with 3962 points or -15%. 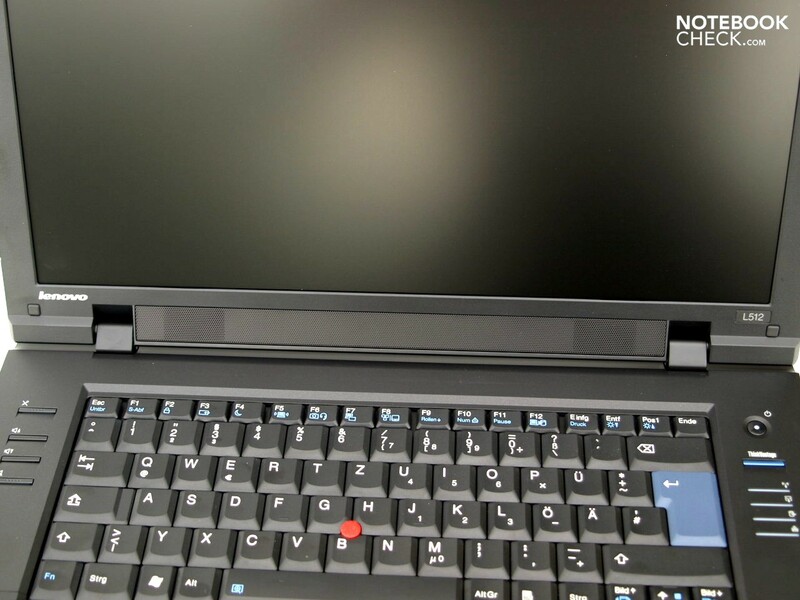 The ThinkPad L512 achieves a bit more with 6333 than the Probook 6540b from HP (6254 points) or Dell's Vostro 3500 (6136 points) in the Cinebench Rendering 32 bit test. Acer's Extensa 7630G lags a bit behind with 4768 points in comparison to 5269 points in the 64 bit variant of the same test. It's clear from the beginning that big leaps can't be expected from the Graphics Media Accelerator HD integrated in the processor. If you pick out the 1316 points in 3DMark06, it quickly becomes obvious that Lenovo's ThinkPad L512 doesn't have a chance against our comparison candidates from above. All of them are equipped with more or less strong, dedicated graphic cards. The Acer Extensa 7630G reaches 162% more with 3449 points. HP's Probook 6540b has about the same magnitude with 3465 points. Dell's Vostro 3500 places itself below that with 3206 points, which is still a plus of 243%. The W700's graphic performance remains out of reach for all with 11111 points. We have refrained from extensive gaming tests due to this and due to the L512's intended application field, and would like to direct interested parties to our gaming list and our benchmark list. A comparison with laptops that have the same CPU and GPU also turns out to be interesting. The Lenovo L512 reaches the worst results across the board in CPU and graphic biased benchmarks. The Fujitsu Siemens AH 550, for instance, reaches 2924 points in the single rendering 64 bit Cinebench test (~+50%), 6690 points in the multi-rendering 64 bit (~+7%) and 1852 points in shading 64 bit (~+12%). The built-in mass memory is a HTS545025B9A300 from Hitachi. It provides a gross capacity of 250 GB and does its job with 5400 revolutions per minute. 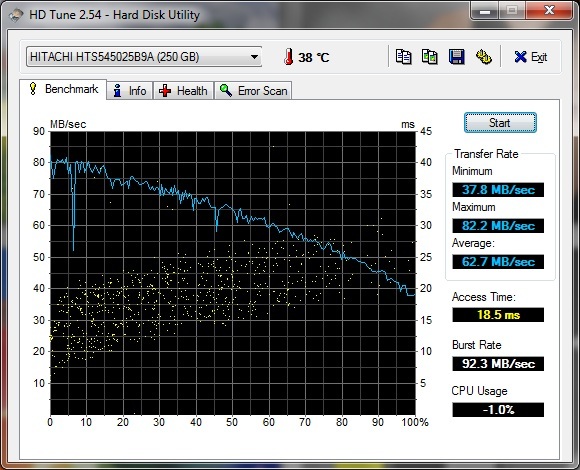 The established measured data with HDTune was without irregularities. 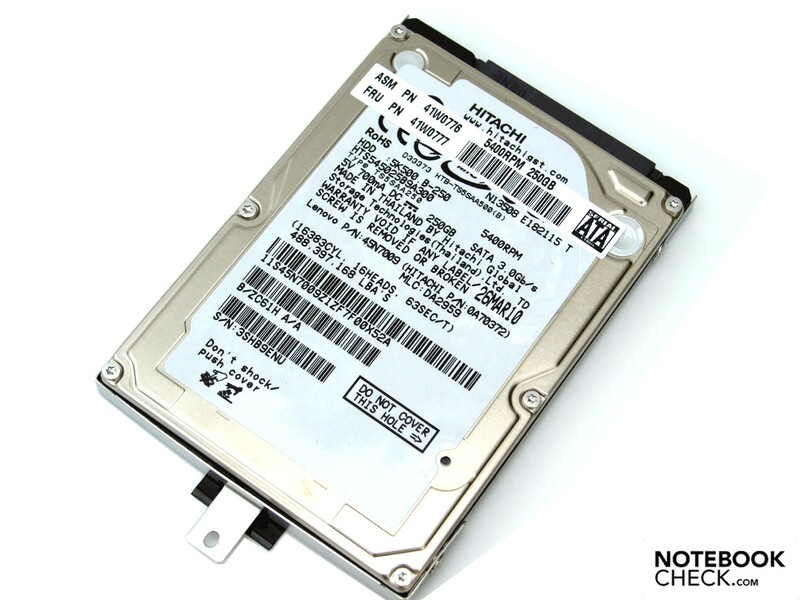 Again, you can choose among various alternative in the US online shop, starting with 160 GB hard disks with 4500 rpm over 7200 rpm up to a 500 GB disk with 5400 rpm. A Matshita DVD-RAM UJ890 is used as the optical drive in the test device. According to our noise measurements, the L512's operating noise is always within a limit. This also applies to the subjective impression. You can't distinguish a disturbing fan characteristic and you perceive the noise as a still pleasant low frequency hum in maximum volume. Merely the DVD drive can get quite loud during data transfer with up to 46 db (A). The upper side, independent of the operating load, always stays agreeably cool. In return, the bottom partly reaches almost 40 degrees Celsius under load. Therefore, using it on the lap is only recommendable for the intended application field, which is office load. (-) The average temperature of the palmrest area of similar devices was 28.2 °C / 82.8 F (-4.7 °C / -8.4 F). The loudspeakers are placed on the lower display bezel. They have an excellent sound for an office notebook. The sound is quite balanced and even stays clear at maximum volume. But they can't at all keep up with a stereo system. Those who expect a very good battery life due to the BatteryEater Reader's test, in which almost five and a half hours are reached with minimum display brightness, disabled Wi-Fi modules and energy savings profile, will be disappointed. The minimum brightness is definitely not suitable in practice. 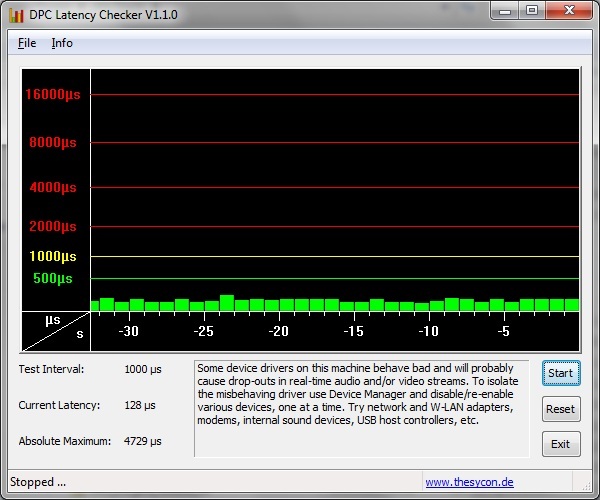 Thus, our WLAN test was executed in a 15/15 brightness level. The runtime is therewith decreased by almost two hours due to the enabled WLAN module, whereby it ran in a low load condition for this. This was reading websites and no flash videos. Finally, only two and a quarter hours are possible remote from the mains in the DVD test on "high performance profile". The stress test with BatteryEater's Classic test, with enabled WLAN module and high performance profile, records even only a bit over one and a half hours for the ThinkPad L512. The battery runtimes were determined with the included 6 cell lithium ion battery with a capacity of 57 Wh. Longer runtimes should be expected with the optional 9 cell battery. If you'd like to save weight on the go, you can also choose a 4 cell battery in the US. The Lenovo really shows its strength in power consumption. It undisputedly scores highest of all devices in review with the same processor and same graphic chip. The comparably equipped Fujitsu Lifebook AH550, for example, consumes about 55.4 watts in full load and thus a whole 44% more than our Thinkpad L512 test candidate. It looks similar with the minimum power consumption in idle mode. 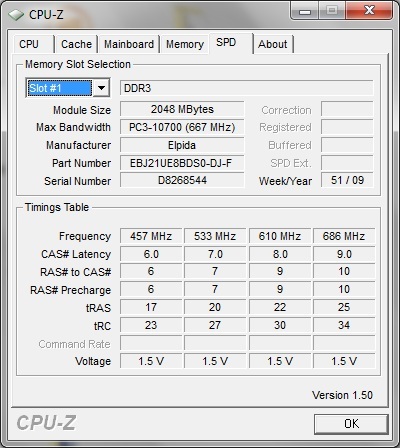 The rates of the minimum power consumption are much closer in both other notebooks with the same CPU and GPU configuration, the Toshiba Satellite Pro S500-115 and the MSI CR620, but a superiority of the L512 is seen at increasing energy consumption even here. Naturally, this can't be achieved without affecting other areas: The devices mentioned above score better across the board in the graphic and processor biased benchmarks. The low power consumption of less than 0.5 watts in a turned off state or in standby is also pleasing. The adapter (65 watts) is also sufficiently sized for the maximum consumption of 38.4 watts. "Think Performance, Think Productivity, Think Green" is so nicely said in Lenovo's "Thinkpad L tour" promotional video. But even Lenovo can't withdraw from a trade-off between performance and energy saving. A choice in favor of a low power consumption and consequently a longer battery life has obviously been made. 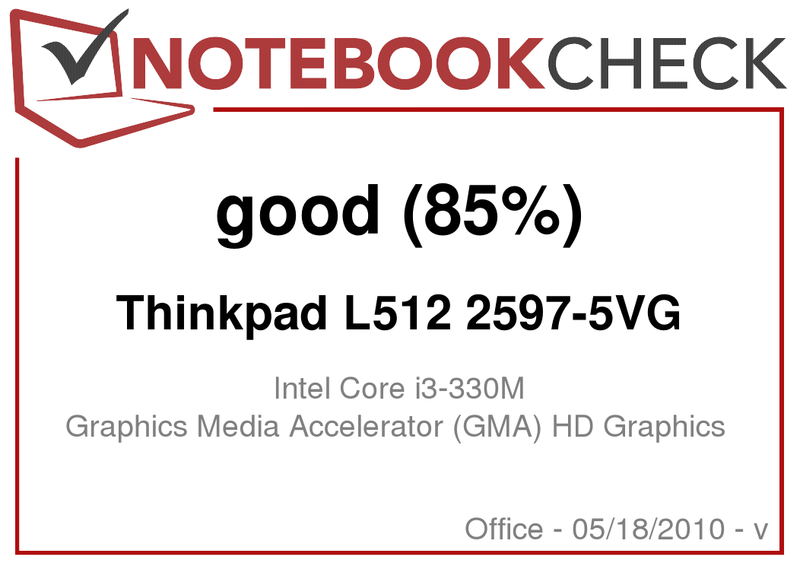 Therefore, the ThinkPad L512 scores the poorest in regards to graphic performance and processor performance in comparison to other laptops we have already reviewed, and which also work with an Intel Core i3 330M CPU and integrated GMA HD graphic chip. There's nothing new about the look and feel: The status LEDs are now placed very obviously on the right beside the keyboard, whilst the area left of it is used for multimedia control. Surprisingly, the pressure stability of the components around the keyboard leaves something to be desired this time. 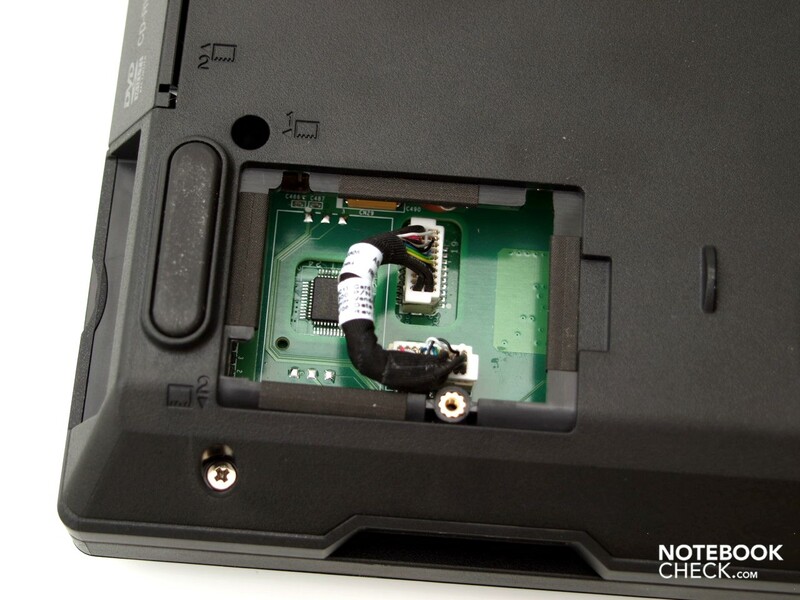 The splash water protected keyboard has been improved according to Lenovo, but this isn't visible. Two comfortable mouse replacements, a touchpad and the trackpoint are as always part of the group. Combined with a matt office suitable display, a hard work day at the display can absolutely be survived quite well. However, the display could have been a bit brighter for the use in direct sunlight. If you are looking for a fairly energy saving laptop, in view of the hardware components, with nevertheless a good application performance, you can consider the Thinkpad L512 even if the possibilities of the built-in components aren't used to the full anymore. A matt business suitable display - a bit more brightness for outdoor use would have been desirable, though. The standard configuration of a ThinkPad L512: Core i3 330M, integrated GMA HD graphic chip and only a 2 GB RAM. The loudspeakers in the lower display bezel: Good sound quality. A use on the lap isn't recommendable under full load - otherwise the laptop stays pleasantly cool. Fan grill on the rear. Powered USB port and Kensington on the rear. DC-in behind the optical drive on the right edge. Mini Dock Plus Series 3: Probably only available in the US. and multimedia control beside the keyboard - but you have to do without a number pad. Security features, like, e.g. a fingerprint scanner. Unfavorable port placement for lefties: VGA, eSATA/USB 2.0, LAN, display port. Front right: Two USB 2.0 ports, a 7-in-1 cardreader and the Wi-Fi main switch. That Lenovo has obviously worked on the power consumption adamantly. Manufacturer specs on the German website, and at least a downloadable manual. Status LEDs and multimedia components beside the keyboard. In a 15.6 inch office device, you would likely prefer to see a keyboard with a separate number pad. Inexpensive business devices, like for instance Dell's Vostro 3500 or also the Extensa 7630G from Acer, which however can't compete with Lenovo's Green IT claim with their hardware. 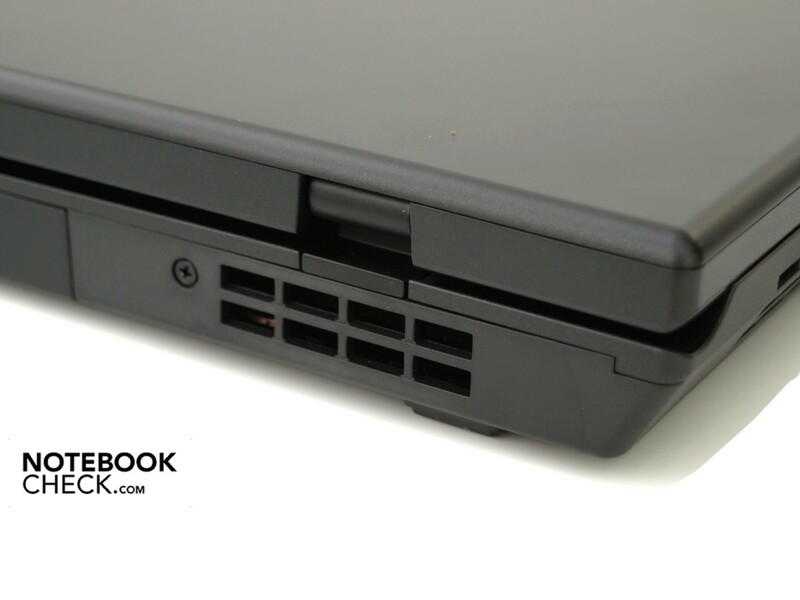 The HP Probook 6540b is also an interesting alternative with a strong performance.